MoonMarble.com - Bruce Troeh - "Baseball Marble"
Marbles - Collect or Play → Specialty Marbles → Bruce Troeh - "Baseball Marble"
This is a handmade marble by Bruce Troeh. 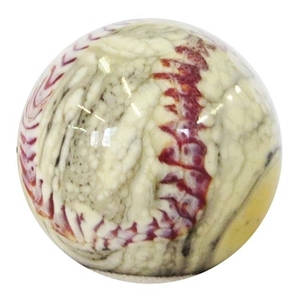 It is one of Bruce's signature "baseball" style marbles. It measures approximately 1" in diameter. He uses ivory glass which will have a worn leather look with the occasional black scuff mark of a well-played ball. This is a handmade marble and will have slight variances from one marble to the next. It is signed and dated by the artist.